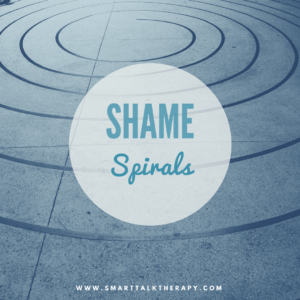 As we continue to focus on shame and how it impacts our daily living it is important to take a moment and learn about shame spirals. Moderate, healthy shame comes in waves. It can cause the person to retreat and isolate for a little while but eventually the shame subsides and the person re-emerges into society. Shame spirals on the other hand can last for months and can have lasting effects on the person that they affect. They can turn into whirlpools that create more and more isolation as the shame-based person retreats more and more into his/her shame. A typical shame spiral usually starts with someone becoming aware of a deficiency. It can be anything from forgetting to take out the trash, to forgetting to call a friend back. It is usually something small and meaningless. This is known as immediate shame. This immediate shame then triggers the person to start to remember other past moments of shame. The shame-based person will start to recall his/her history of shameful events which supports the ideas that "you are not worthy" or "this is so typical of you to forget to do that". As the person gets flooded with these memories of past shame and a third thing happens. The person starts to feel shame for his/her shame and starts to give himself/herself messages such as "if you were a true man you could deal with this emotion". As the shame spiral progresses, the person will start to isolate himself/herself more from society. With the isolation comes a lack of social contact that could help the person attack those shameful thoughts and as a result the shameful thoughts are strengthened. Shame spirals are just a piece of the puzzle though that create and maintain shame in our lives. Everything that you have read about in this blog was derived from the book Letting Go of Shame by Ronald Potter-Efron and Patricia Potter-Efron. We have no personal or professional stake in this book; it's just a good book. Since shame has been coming up more and more frequently in our work with clients we decided to spotlight this emotion (and book) this month in order to bring more awareness to the powers of shame. We continue to accept new clients from Illinois (Chicago), California (Los Angeles, San Diego, Orange County, Santa Barbara, San Francisco, Sacramento), and outside of the USA (Canada, Australia, New Zealand, England, Ireland, Scotland, Wales, United Kingdom, Germany, France, Spain, Mexico).